To celebrate Library Ireland Week 2018, an annual event dedicated to celebrating the vital role libraries play in the civic, social, cultural and academic development of our communities, Athlone Institute of Technology’s library will be hosting a range of competition, games and other such activities commencing Monday 26th November. As this year’s Library Ireland Week will coincide with the Students’ Union’s ‘Less Stress Week’, the library has decided to offer students amnesty on all library fines institute-wide. All students with overdue books are encouraged to return them and make use of this amnesty. There will also be a pop-up library in the Students’ Union to motivate students to engage with library services. A goal of the events is also to help break down any perceived barriers to students accessing and using the library. It is vital that students see the library as the heart of the institute and make use of its facilities to ensure their academic and personal success. To aid in this endeavour, the library will also be running a series of competitions and games throughout the week to elicit student engagement. 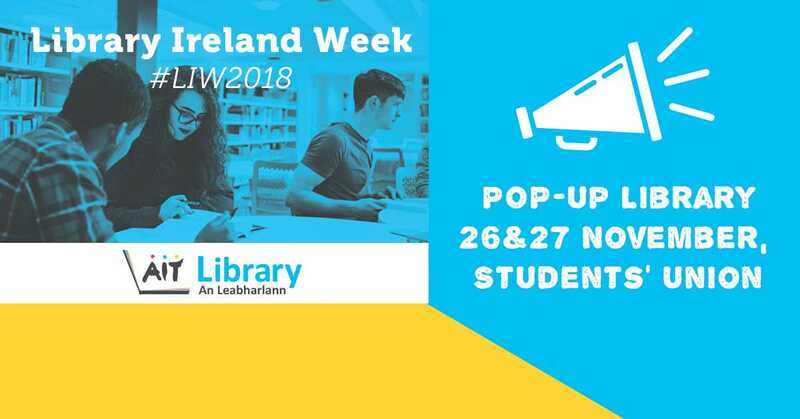 Elsewhere throughout Ireland, public libraries, special libraries, business libraries, health libraries, law libraries, academic libraries, prison libraries and government libraries will celebrate by showcasing their unique resources, running events and engaging in a nationwide social media campaign. Follow the conversation on social media using #LIW2018 and @LAIonline. Athlone Institute of Technology is a modern and dynamic HEI distinguished by outstanding learner experience, international focus and applied research and innovation. Awarded Sunday Times Institute of Technology of the Year 2018, AIT is currently ranked 9th nationally of all HEIs in the league table comprising of Irish Universities and IoT’s. Athlone Institute of Technology boasts a wide array of courses in the Faculties of Engineering and Informatics, Business and Hospitality, and Science and Health. For the full list of courses on offer at Athlone Institute of Technology click here.